You may not require a Fairfax accident lawyer to reach a settlement with the insurance company, but before you sign the settlement release, understand that there are certain rights you may be giving up. If you find that further legal action is necessary to pay future expenses related to your injuries, you may need to hire an attorney, and even then there may not be much that can be done in the face of a signed settlement release. The settlement release is the document that finalizes your accident claim. It basically states that the insurance company agrees to pay the settlement in exchange for the termination of your accident claim. Most settlement releases include language indicating that you basically give up your right to reopen the case or file an additional personal injury lawsuit. In some rare cases, you may be able to obtain an open-ended settlement release in which you retain your right to file for compensation of future medical expenses. 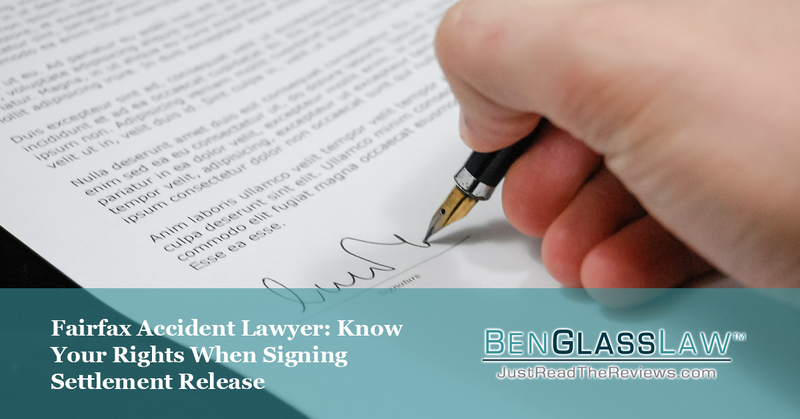 Before you sign that settlement release, read it carefully and make sure you understand the exact terms to which you are agreeing. Remember to make sure that the amount you are agreeing to will cover your current damages and that future expenses are properly accounted for. Once your case settles there’s no turning back after the settlement release is signed. If you think you’re ready to handle your accident case on your own I encourage you to visit my website and download a FREE digital copy of my book, Get It Settled! The Accident Victim’s Guide to Settling Your Case Without Hiring a Lawyer. Of course, I won’t leave my clients hanging in the wind – if you think you really need a Fairfax accident lawyer to settle your case, contact Ben Glass Law at our website, or give us a call at 703-584-7277 and to set up a consultation.